Thioalkalivibrio sp. K90mix is an obligately chemolithoautotrophic, natronophilic sulfur-oxidizing bacterium (SOxB) belonging to the family Ectothiorhodospiraceae within the Gammaproteobacteria. The strain was isolated from a mixture of sediment samples obtained from different soda lakes located in the Kulunda Steppe (Altai, Russia) based on its extreme potassium carbonate tolerance as an enrichment method. Here we report the complete genome sequence of strain K90mix and its annotation. The genome was sequenced within the Joint Genome Institute Community Sequencing Program, because of its relevance to the sustainable removal of sulfide from wastewater and gas streams. Thioalkalivibrio sp. K90mix is an obligately chemolithoautotrophic SOxB using CO2 as a carbon source and reduced inorganic sulfur compounds as an energy source. It belongs to the genus Thioalkalivibrio. This genus represents a dominant SOxB type in soda lakes – extremely alkaline and saline habitats - and is the first example of an obligate chemolithoautotroph capable of growing in saturated sodium carbonate brines. It forms a monophyletic group within the family Ectothiorhodospiraceae of the Gammaproteobacteria. The genus currently includes nine validly published species  and around 70, yet uncharacterized strains that are extremely salt-tolerant and genetically different from the characterized isolates recovered from hypersaline soda lakes [2-4]. The members are slow growing obligate autotrophs, well adapted to hypersaline (up to salt saturation) and alkaline (up to pH 10.5) conditions. Members of the genus Thioalkalivibrio have versatile metabolic capabilities, including oxidation of reduced sulfur compounds [1,2], denitrification [5,6] and thiocyanate utilization [7,8]. Apart from playing an important role in the sulfur cycle of soda lakes, Thioalkalivibrio species also are being used for the sustainable removal of sulfide from wastewater and gas streams [9,10]. In this process hydrogen sulfide is absorbed to a high salt alkaline solution, which is subsequently transferred to a bioreactor in which Thioalkalivibrio spp. oxidize HS- to elemental sulfur. The produced biosulfur can then be used as a fertilizer or fungicide . To get a comprehensive understanding of the molecular mechanism by which Thioalkalivibrio sp. K90mix oxidize sulfur compounds and adapts to extreme alkaline (up to pH 10.5) and hypersaline conditions (up to 4 M of Na+ or 3.6 M of K+) it is necessary to identify the genes that are involved in these adaptations. The most important issues in this are the mechanism of sulfide oxidation, carbon assimilation at high pH, and bioenergetic adaptation to high salt and high pH. Here we present a summary classification and a set of features for Thioalkalivibrio sp. K90mix together with the description of the genomic sequencing and annotation. Because of limited solubility of sodium carbonates in the biodesulfurization process, we made a series of enrichment cultures with an increasing ratio of potassium to sodium carbonate (potassium carbonates have a 2-5 times higher solubility than sodium carbonates). Thioalkalivibrio sp. K90mix was isolated from a culture that was inoculated with a mixture of sediment samples from different hypersaline soda lakes and was grown at the maximal possible substitution of sodium for potassium, 3.6 M K+/0.4 M Na+ (90% substitution). Thioalkalivibrio sp. K90mix has rod-shaped cells with a polar flagellum (Figure 1), that elongate at high concentrations of K+ (Figure 1b). The strain is obligately alkaliphilic with a pH optimum of 10 (Table 1). It can tolerate a salinity of 4.0 M total Na+, but has an optimum of 0.3 M, sulfide concentrations up to 1 mM and a temperature up to 40°C. It has a preference for carbonate and sulfate as counter-anions over chloride and, therefore must be called “natronophilic”, instead of “haloalkaliphilic”. It utilizes ammonia, nitrate and nitrite as a nitrogen source. On the basis of 16S rRNA gene sequencing the strain belongs to the genus Thioalkalivibrio within the Gammaproteobacteria with T. thiocyanoxidans and T. nitratis as the closest described species (Figure 2). 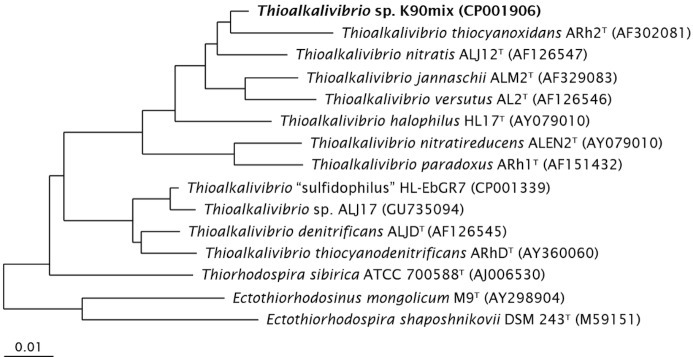 Most of the yet undescribed Thioalkalivibrio isolates from hypersaline lakes of Siberia and Mongolia also belong to this core genetic cluster of the genus Thioalkalivibrio. Phase contrast micrographs of the cell morphology of Thioalkalivibrio sp. K90mix grown at pH 10 and 4 M Na+ (a), or 3.6 M K+/0.4 M Na+ (b). Classification and general features of Thioalkalivibrio sp. K90mix according to the MIGS recommendations . Phylogenetic tree based on 16S rRNA sequences showing the phylogenetic position of Thioalkalivibrio sp. K90mix. The sequence was aligned to sequences stored in the SILVA database using the SINA Webaligner . Subsequently, the aligned sequences were imported into ARB , and a neighbor joining tree was constructed. Sequences of members from the Alphaproteobacteria were used as outgroup, but were pruned from the tree. The scale bar indicates 1% sequence difference. Strain K90mix was selected for sequencing in the 2007 Joint Genome Institute Community Sequencing Program, because of its relevance to bioremediation. A summary of the project information is presented in Table 2. The complete genome sequence was finished in February 2010. The GenBank accession numbers are NC_013889 and NC_013930 for the chromosome and plasmid, respectively. The genome project is listed in the Genome OnLine Database (GOLD)  as project Gc01217. Sequencing was carried out at the Joint Genome Institute (JGI) Finishing was done by JGI-Los Alamos National Laboratory (LANL) and initial automatic annotation by JGI-Oak Ridge National Laboratory (ORNL). Thioalkalivibrio sp. K90mix was grown with 40 mM thiosulfate as an energy source in standard sodium carbonate-bicarbonate medium at pH 10 and 2 M Na+  at 35oC with shaking at 200 rpm. The cells were harvested by centrifugation and stored at minus 80°C for DNA extraction. Genomic DNA was obtained using phenol-chloroform-isoamylalcohol (PCI) extraction. The genomic DNA was extracted using PCI and precipitated with ethanol. The pellet was dried under vacuum and subsequently dissolved in water. The quality and quantity of the extracted DNA was evaluated using the DNA Mass Standard Kit provided by the JGI. The genome of Thioalkalivibrio sp. K90mix was sequenced using a combination of Sanger and 454 sequencing platforms. All general aspects of library construction and sequencing can be found at the JGI website . Pyrosequencing reads were assembled using the Newbler assembler version 1.1.02.15 (Roche). Large Newbler contigs were broken into 3,292 overlapping fragments of 1,000 bp and entered into assembly as pseudo-reads. The sequences were assigned quality scores based on Newbler consensus q-scores with modifications to account for overlap redundancy and adjust inflated q-scores. A hybrid 454/Sanger assembly was made using the PGA assembler. Possible mis-assemblies were corrected and gaps between contigs were closed by editing in Consed, by custom primer walks from sub-clones or PCR products. A total of 181 Sanger finishing reads were produced to close gaps, to resolve repetitive regions, and to raise the quality of the finished sequence. Illumina reads were used to improve the final consensus quality using an in-house developed tool (the 'Polisher' ). The error rate of the completed genome sequence is less than 1 in 100,000. Together, the combination of the Sanger and 454 sequencing platforms provided 42.1× coverage of the genome. The final assembly contains 28,443 Sanger reads (10.0×) and 419,015 pyrosequencing reads (32.1×). Genes were identified using Prodigal  as part of the Oak Ridge National Laboratory genome annotation pipeline followed by a round of manual curation using the JGI GenePRIMP pipeline . The predicted CDSs were translated and used to search the National Center for Biotechnology Information (NCBI) nonredundant database, UniProt, TIGRFam, Pfam, PRIAM, KEGG, COG, and InterPro, databases. Additional gene prediction analysis and functional annotation was performed within the Integrated Microbial Genomes Expert Review (IMG-ER) platform . The genome of strain K90mix consists of a circular chromosome with a size of 2.74 Mbp (Figure 3) and a linear plasmid of 240 Kbp. The G+C percentage determined from the genome sequence is 65.54%, which is similar to the value determined by thermal denaturation (65.8±0.5 mol%). There are 2942 genes of which 2888 are protein-coding genes and the remaining 54 are RNA genes. 33 pseudogenes were identified, constituting 1.12% of the total number of genes. The genome is smaller than that of “Thioalkalivibrio sulfidophilus” HL-EbGr7 , 2.98 Mbp versus 3.46 Mbp, but has a similar percentage of protein-coding genes (98.16% versus 98.06%). The properties and statistics of the genome are summarized in Table 3, and genes belonging to COG functional categories are listed in Table 4. Graphical circular map of the chromosome of Thioalkalivibrio sp. strain K90mix. From outside to the center: Genes on the forward strand (Colored by COG categories), Genes on the reverse strand (colored by COG categories), RNA genes (tRNAs green, rRNAs red, other RNAs black), GC content, GC skew. As mentioned before,  autotrophic growth at extremely high pH is a problem, because inorganic carbon is mainly present as carbonate (with bicarbonate as a minor fraction) at pH values above 10. This would demand active transport of bicarbonate into the cell. We found a gene related to stbA encoding a Na+/HCO3- symporter in the marine cyanobacterium Synechocystis sp. strain PCC 6803 . 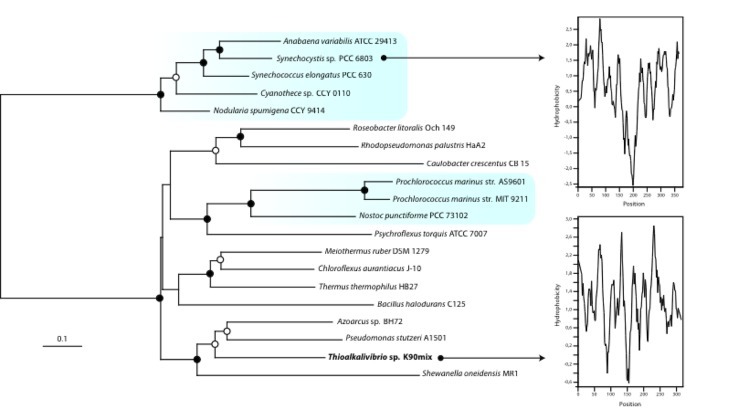 Figure 4 shows a phylogenetic tree of different sequences related to StbA and the hydrophobicity profiles of StbA of Synechocystis sp. PCC 6803 and Thioalkalivibrio sp. K90mix. In addition, we have found genes for the large (TK90_0858) and small subunit (TK90_0859) of RuBisCO form 1Ac, and for the synthesis of α-carboxysomes (TK90_0860 – TK90_0866), including csoSCA encoding a carboxysome shell alpha-type carbonic anhydrase, which was also found in genomic analysis of “Thioalkalivibrio sulfidophilus” HL-EbGr7 . Phylogeny and hydropathy of StbA from different microorganisms. The blue boxes indicate sequences belonging to the cyanobacteria. The dots on the branches are bootstrap values between 50% and 75% (open dots) or between 75% and 100% (closed dots) The scale bar indicated 10% sequence difference. The sequence of Thioalkalivibrio sp. K90mix is indicated in bold. 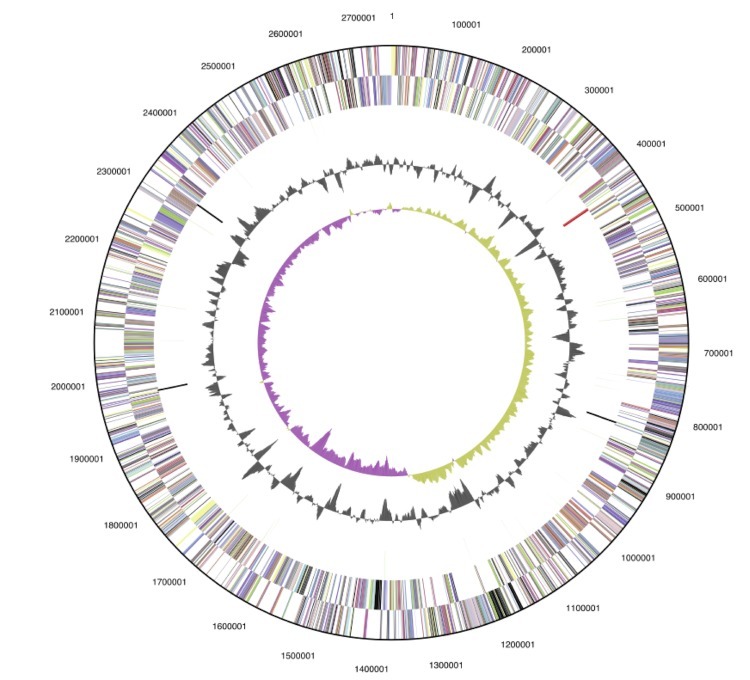 Hydropathy profiles were made for the StbA protein sequences of Synechocystis sp. PCC6803 and Thioalkalivibrio sp. K90mix to indicate transmembrane spanning domains. Thioalkalivibrio sp. K90mix can oxidize sulfide/polysulfide, thiosulfate, sulfite (in vitro) and elemental sulfur to sulfate. Elemental sulfur is formed as an intermediate during sulfide and thiosulfate oxidation at oxygen limitation and near-neutral pH. Figure 5 shows a schematic overview of the different genes that are involved in the oxidation of sulfur compounds. The genome of Thioalkalivibrio sp. K90mix contains genes for flavocytochrome c/sulfide dehydrogenase (TK90_0236), which oxidizes sulfide to elemental sulfur. It contains an incomplete set of sox genes including soxYZ (TK90_0123 and TK90_0124), soxAX (TK90_0432 and TK90_0433) and two copies of soxB (TK90_0627 and TK90_1150), but is lacking soxCD, which would allow oxidizing the sulfane atom of thiosulfate to the state of elemental sulfur, but no further. However, it does not contain the reverse dissimilatory sulfite reduction pathway to oxidize sulfur to sulfite, which has been found in the genome of “Thioalkalivibrio sulfidophilus” HLEbGr7 . Absence of dsr genes has also been found for the green sulfur bacterium Chloroherpeton thalassium that can oxidize sulfide to elemental sulfur, but subsequently can only oxidize the produced sulfur very slowly , probably due to the absence of dsr. Frigaard and Dahl  suggested that the presence of a RuBisCo-like protein (RLP) might be involved in sulfur oxidation . Genes encoding for the RuBisCo-like protein were not found, nor were genes encoding sulfur dioxygenase or sulfur oxygenase-reductase, which can oxidize or disproportionate sulfur in several acidophilic bacteria and archaea . However, we found a gene cluster encoding two sulfur transferases (rhd, TK90_0630; sirA, TK90_0631) and a heterodisulfide reductase complex (TK90_0632 - TK90_0637) consisting of hdrA, hdrB, and hdrC (Figure 6). dsrE was missing in this cascade, but was present at 3 other places in the genome (TK_0511, TK_0639, TK90_1244). Schematic overview of the different genes that are involved in the oxidation of sulfur compounds, although the role of the Hdr complex has not been proven yet. The genes encoding the reverse dissimilatory sulfite reductase (dsr), which are present in the genome of Thioalkalivibrio sulfidophilus, are absent in the genome of Thioalkalivibrio sp. K90mix. Comparison of the hdr cluster of A. ferroooxidans ATCC 23270 (AF), Thioalkalivibrio sp. K90mix (K90) and Thioalkalivibrio sulfidophilus HL-EbGR7 (HL). The heterodisulfide reductase complex consists of the genes encoding HdrC1, HdrB1, HdrA, orf2, HdrC2 and HdrB2. The accessory proteins are Rhd, and TusA. DsrE was not found in this order, but was present at other places in the genome. The percentage of amino-acid similarity is indicated. The Hdr complex plays a function in the energy metabolism of methanogens  and sulfate-reducing prokaryotes . In methanogens, the enzyme complex catalyzes the reversible reduction of the disulfide (CoM-S-S-CoB) of the two methanogenic thiol-coenzymes, coenzyme M (CoM-SH) and coenzyme B (CoB-SH); in sulfate reducing microorganisms the substrate (X-S-S-X) is not known. Recently, the genes encoding the Hdr complex have also been detected in the genomes of the acidophilic sulfur oxidizing bacteria Acidithiobacillus ferrooxidans  and Acidithiobacillus caldus . Quantrini and co-workers  hypothesized that Hdr, like the dissimilatory sulfite reductase (dsr), is working in reverse, whereby sulfur (i.e., sulfane atom) is oxidized to sulfite, and electrons are donated to the quinone pool. Although the role of the Hdr complex in the sulfur metabolism still has to be confirmed by expression analysis, Hdr genes have not yet been detected in the genomes of the neutrophilic chemolithotrophic sulfur-oxidizing bacteria Thiomicrospira crunogena and Thiobacillus denitrificans or of phototrophic sulfur-oxidizing bacteria Allochromatium vinosum and Halorhodospira halophila. The absence of a reverse dsr pathway in Thioalkalivibrio sp. K90mix might be the reason why it can only tolerate sulfide concentrations up to 1 mM. 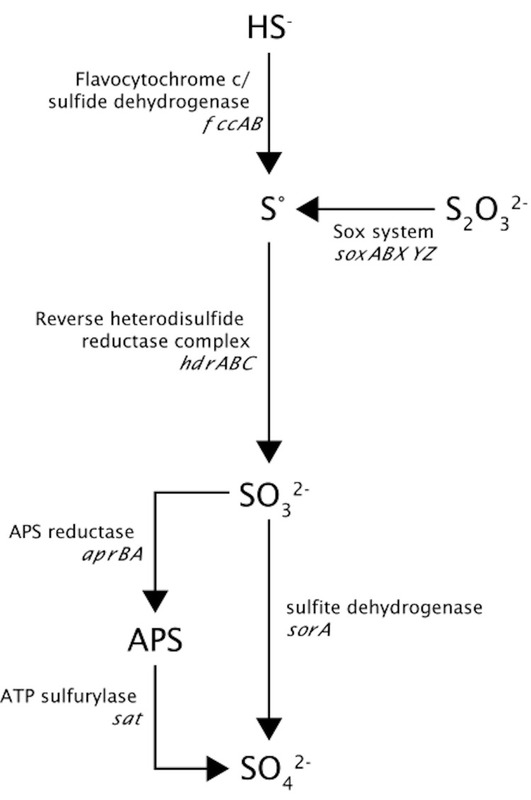 Sulfite can be oxidized further to sulfate, either directly by sulfite dehydrogenase (sorA; TK90_0686) or indirectly via adenosine-5’-phosphosulfate (APS) by APS reductase encoded by aprBA (TK90_0064 and TK90_0065) and ATP sulfurylase encoded by sat (TK90_0062) . All these genes are present in the investigated genome. At this time, it is not clear how Thioalkalivibrio sp. K90mix can withstand the harsh conditions of high pH and salinity. The difference between the pH of the environment (pH 10) and the pH in the cell (pH 8) causes a reversed ΔpH and consequently lowers the proton motive force (PMF). Therefore, Thioalkalivibrio requires a special molecular mechanisms to obtain enough energy for growth. It certainly needs this energy, because the production of osmolytes, to withstand the high concentrations of salts, costs 55 molecules of ATP for one molecule of glycine betaine, and 110 molecules of ATP for 1 molecule of sucrose . In addition, the chemolithoautotrophic life style of CO2 fixation is energetically very expensive. The redox potential of the substrate couple S°/HS- (-260 mV) is more positive that the potential of NAD+/NADH (-340 mV) and therefore the direct reduction of NAD+ in order to supply reducing equivalents for CO2 fixation is not possible. Reverse electron transport is necessary in order to produce enough NADH, necessary for CO2 fixation, which costs extra energy. In addition, because of the large pH gradient over the cell membrane Thioalkalivibrio needs special mechanisms to keep the intracellular pH around neutral (pH homeostasis), which again is an energy requiring process. The genome has revealed genes encoding similar proteins as those found for “Thioalkalivibrio sulfidophilus” HL-EbGr7 . We found genes for a proton-driven F0F1-type ATP synthase (i.e., subunit A TK90_2593, B TK90_2591, and C TK90_2592of the F0 subcomplex, and subunit alpha (TK90_2589), beta (TK90_2587), gamma (TK90_2588), delta (TK90_2590), and epsilon (TK90_2586) of the F1 subcomplex), genes encoding the proton-translocating NADH dehydrogenase (nuoABCDEFGHIJKLMN) (TK90_0708 to TK90_0721), as well as the genes for a putative primary sodium pump Rnf  (rnfABCDGE) (TK90_1790 to TK90_1795). In addition, we found several genes encoding different secondary sodium-dependent pumps, such as the Na+/H+ antiporters NhaP (TK90_1831) and Mrp (mnhA-G) (TK90_0748 to TK90_0752), which according to Padan et al. both play an essential role in alkaline pH homeostasis. In addition, we found genes encoding transporters belonging to the SulP family (TK90_0019, TK90_0897, TK90_0985). Transporters of this group could be involved in the low affinity, but high flux of bicarbonate uptake . In addition, genes encoding the sodium-depending flagellar motor PomA/B (TK90_1180 and TK90_1181) are also present in the genome (see below for more details). As Thioalkalivibrio sp. K90mix can stand high concentrations of potassium, we also searched for K+-transporters and found genes encoding the following transporters: TrkA-C (TK90_0502), TrkA-N (TK90_2266) and TrkH (TK90_2267) that are part of the potassium uptake system . We found different genes encoding methyl-accepting chemotaxis sensory transducers (TK90_0580, TK90_0949, TK90_1402, TK90_2562, TK90_2397) that are involved in chemotaxis. One of these genes, Aer (TK90_0580), encodes a redox sensor involved in aerotaxis. In E. coli, Aer regulates the motility behavior in gradients of oxygen, redox potential and certain nutrients by interacting with the CheA-CheW complex. We found genes encoding several different proteins of this complex, CheA (TK90_1178), CheW (TK90_1183 and TK90_1184), CheY (TK90_1176), CheZ (TK90_1177), CheB (TK90_1179), CheV (TK90_0924) and CheR (TK90_0925). Chemotaxis consists of a complex cascade of different reactions: the redox sensor Aer senses a difference in redox potential induced by a change in the environmental oxygen concentration, which leads to the autophosphorylation of the histidine protein kinase CheA. CheA phosphorylates CheY, which will switch on the flagellar motor (see  for a detailed overview). CheW acts as an adaptor protein, while CheB, CheR, CheZ, and CheV are involved in feedback regulation. Thioalkalivibrio sp. K90mix has all the genes that are indispensable for the production of flagellar proteins (FlgA, TK90_0923; FlgB, TK90_0926; FlgC, TK90_0927; FlgD, TK90_0928; FlgE, TK90_0929; FlgF, TK90_0930; FlgG, TK90_0931; FlgH, TK90_0932; FlgI, TK90_0933; FlgK, TK90_0935; FlgL, TK90_0936; FlgM, TK90_0922; FlgN, TK90_0921; FliC, TK90_1400, 1448, 1450; FliD, TK90_1447; FliE, TK90_1157; FliF, TK90_1158; FliG, TK90_1159; FliH, TK90_1160; FliI, TK90_1161; FliJ, TK90_1162; FliK, TK90_1163; FliM, TK90_1165; FliN, TK90_1166; FliO, TK90_1167; FliP, TK90_1168; FliQ, TK90_1169; FliR, TK90_1170; FliS, TK90_1446; FlhA, TK90_1172; FlhB, TK90_1171; see Table 1 in ). Phylogenetic analysis of sequences encoding different flagellar motors showed, with significant bootstrap values, genes encoding both proton-driven motors (TK90_0578, TK90_0577) related to E. coli MotA and MotB, as well as sodium-driven motors (TK90_1180, TK1181) related to Vibrio cholera PomA and PomB and Bacillus subtilis MotP and MotS (Figure 7). The results also show the presence of proton- and sodium-driven flagellar motors in the Ectothiorhodospiraceae, “Thioalkalivibrio sulfidophilus”, Halorhodospira halophila, and Alkalilimnicola ehrlichei, as well as in Achromatium vinosum, Acidithiobacillus caldus, Vibrio alginolyticus and Vibrio parahaemolyticus. Vibrio cholerae, Bacillus subtilis, B. halodurans, and Nitrococcus mobilis only have sodium-driven flagellar motors. 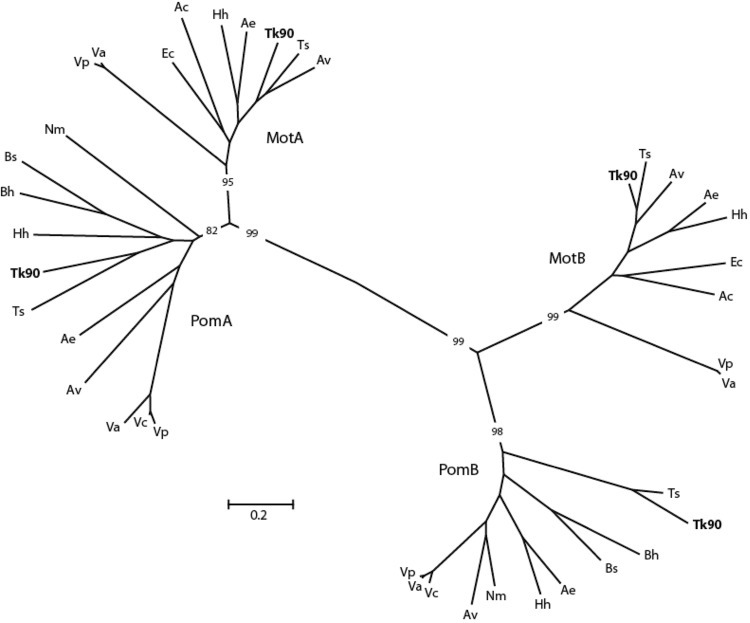 Grouping of the proton-driven MotA and sodium-driven PomA has also been found by Krulwich et al. .
Phylogenetic tree based on protein sequences of different flagellar motors. The sequences of the proton-driven flagellar motor MotAB from E. coli (ECDH10B_2031, ECDH10B_2030) and of the sodium-driven flagellar motor PomAB from V. cholerae (VC0892, VC0893) were used as reference proteins. Other proteins were selected after BLAST analysis. Subsequently, the selected protein sequences were aligned used Clustal W, and a neighbor joining tree was drawn using MEGA 5. Ac, Acidithiobacillus caldus ATCC 51756; Ae, Alkalilimnicola ehrlichei MLHE-1; Av, Allochromatium vinosum DSM 180; Bh, Bacillus halodurans C125; Bs, Bacillus subtilis strain 168; Ec, Escherichia coli DH10B; Hh, Halorhodospira halophila SL1; Nm, Nitrococcus mobilis NB-231; Ts, Thioalkalivibrio sulfidophilus HLEbGR7; Tv-K90, Thioalkalivibrio sp. K90mix; Va, Vibrio alginolyticus 12G01; Vc, Vibrio cholera O1; Vp, Vibrio parahaemolyticus RIMD2210633. The sequences of Thioalkalivibrio sp. K90mix are shown in bold type. The bar indicates 20% sequence difference. Numbers on the branches indicate percentage bootstrap values from 1000 iterations; only those values are shown that distinguish the different flagellar motors. The CheW sequence of Thioalkalivibrio sp. K90mix (TK90_1183) was used as an outgroup, but was pruned from the tree. Comparative analysis of the genomes of “Thioalkalivibrio sulfidophilus” HL-EbGr7  and Thioalkalivibrio sp. K90mix showed a greater abundance of genes encoding different transposases (i.e., COG2801, COG3328, COG3547) in the latter. Transposases are enzymes that can move specific sequences of DNA, known as transposons or transposable elements, within the genome. Krulwich  found that the genome of the alkaliphilic bacterium Bacillus halodurans C125 contained 112 transposase genes as compared to 10 in the genome of its closest non-alkaliphilic relative B. subtilis. She suggested that this might be one of the mechanisms of alkaliphilic adaptation at the genome level. Although strains HL-EbGr7 and K90mix are both obligately alkaliphilic, they differ in salt tolerance. HL-EbGr7 can tolerate only low (up to 1.5 M) salt concentrations, while K90mix can tolerate high (up to 4 M) salinities. Capy et al. mentioned that environmental stress might stimulate transposition and consequently increase the genetic variability, which can be beneficial for the adaptation to novel environmental conditions. Foti et al. used rep-PCR  to study the genetic diversity within the genus Thioalkalivibrio and found a relatively high diversity of 56 genotypes among 85 strains that were isolated from different soda lakes in Africa and Asia. In addition, preliminary enrichment experiments with potassium carbonate instead of sodium carbonate and higher concentrations of chloride selected populations of high salt-tolerant Thioalkalivibrio strains with different rep-PCR patterns (unpublished results), which might be an indication that transposition might occur more frequently in strains with a wide range of salt tolerance. Reactive oxygen species (ROS), such as superoxides (O2-) and hydrogen peroxidase (H2O2), are naturally produced at hypersaline conditions and are deleterious to cellular macromolecules. To protect themselves from this oxidative stress, Thioalkalivibrio sp. K90mix and “Thioalkalivibrio sulfidophilus” HL-EbGr7 have several defense mechanisms. Superoxides are converted to oxygen and hydrogen peroxide by the enzyme superoxide dismutase (TK90_0947, Tgr7_2463), while hydrogen peroxide is converted to oxygen by hydroperoxidase (TK90_0947, Tgr7_1107) or to H2O by the cytochrome C peroxidase (TK90_0812, Tgr7_2739). In addition, Thioalkalivibrio sp. K90mix produces high concentrations of a specific membrane-bound yellow pigment named ‘natronochrome’ . The pigment has a high degree of unsaturation and might also play a role in the protection against reactive oxygen species (ROS). The gene(s) responsible for the synthesis of this anti-oxidant remains to be identified. Thioalkalivibrio sp. K90mix is an extremely salt-tolerant bacterium. It can grow in saturated sodium and potassium carbonate and sodium sulfate brines containing up to 4 M Na+/K+ but, in contrast to halo-alkaliphiles, it is inhibited by high concentrations of chloride. So, a more proper term for such an extremophile would be an “extreme natronophile”. To withstand these extreme salinities, it synthesizes glycine betaine as the main compatible solute; the genome contains the genes for glycine sarcosine N-methyltransferase (TK90_0179) and sarcosine dimethylglycine methyltransferase (TK90_0180). In addition, the genome contains the gene for sucrose phosphate synthase (TK90_2312) to produce sucrose as a compatible solute. Genes for ectoine were not found. This work was performed under the auspices of the US Department of Energy Office of Science, Biological and Environmental Research Program, and by the University of California, Lawrence Berkeley National Laboratory under contract No. DE-AC02-05CH11231, Lawrence Livermore National Laboratory under Contract No. DE-AC52-07NA27344, and Los Alamos National Laboratory under contract No. DE-AC02-06NA25396, UT-Battelle and Oak Ridge National Laboratory under contract DE-AC05-00OR22725. Dimitry Sorokin was supported financially by RFBR grant 10-04-00152. Sorokin DY, Banciu H, Robertson LA, Kuenen JG. Haloalkaliphilic sulfur-oxidizing bacteria. In: The Prokaryotes. Volume 2: Ecophysiology and Biochemistry 2006; pp. 969-984. Dworkin, M., Falkow S, Rosenberg E, Schleifer KH, Stackebrandt E. (Ed's). Springer, New York. Garrity GM, Bell JA, Lilburn T. Class III. Gammaproteobacteria class. nov. In: Garrity GM, Brenner DJ, Krieg NR, Staley JT (eds), Bergey's Manual of Systematic Bacteriology, Second Edition, Volume 2, Part B, Springer, New York, 2005, p. 1. Imhoff J. Order I. Chromatiales ord. nov. In: Garrity GM, Brenner DJ, Krieg NR, Staley JT (eds), Bergey's Manual of Systematic Bacteriology, Second Edition, Volume 2, Part B, Springer, New York, 2005, p. 1-3. Lapidus A, LaButti K, Foster B, Lowry S, Trong S, Goltsman E. POLISHER: An effective tool for using ultra short reads in microbial genome assembly and finishing. AGBT, Marco Island, FL, 2008. Frigaard N-U, Dahl C. Sulfur metabolism in phototrophic sulfur bacteria. Advances in Microbial Physiology, 2009; 54: 1-3-200. Kappler U. Bacterial sulfite-oxidizing enzymes. Biochim Biophys Acta 2011; 1807: 1-10. Krulwich TA. Bioenergetic adaptations that support alkaliphily. 2007. In: Physiology and biochemistry of extremophiles. Eds. Gerday C, Glansdorff N. ASM Press, Washington, D.C. pp. 311-329. Krulwich TA. Alkaliphily. 2003. In: Extremophiles (Life under extreme conditions) [Eds. Gerday C, Glansdorff N], in Encyclopedia of Life Support Systems (EOLSS). UNESCO-EOLSS.